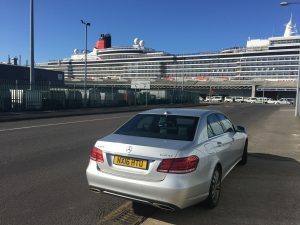 Going on holiday is usually an exciting part of your year, but it can quickly get off on the wrong foot if you arrive late at the airport or shipping dock for your cruise. Booking private transport is something you can tick off your list before the big day arrives, and means you can focus on making sure you have everything packed and ready! Our fleet of luxury vehicles all have climate control, 12 volt charging points for mobiles, tablets and laptops, heated seats and of course a Sat Nav. All of our vehicles have generous legroom and storage space for luggage, but our Mercedes V Class is our largest and most spacious; seating up to seven people with ample space for the not-so-light traveller. Find out about the other luxury features our Mercedes V Class and Chrysler Grand Voyager have here and start your holiday as a VIP.